When I decided to transition to natural beauty products, I went to the most logical place to try new cosmetics - Sephora! I’m not the biggest Sephora shopper - not because I don’t like their products - but because they have SO MUCH OF IT! Whenever I stepped into a Sephora I always felt overwhelmed by all the options and would end up leaving empty-handed. But this time, I had a purpose. I was on a mission to find makeup free of parabens, phthalates, sulfates, gluten and GMOs. I went to the Sephora website and used their online scheduling tool to book a custom makeover. Its free with a $50 purchase which I was planning on making so it was a no brainer. When I arrived at Sephora explained to my makeup artist what my goal was for my appointment. She then went about collecting products from the store floor and returned with products from three brands. We started with skincare. She cleaned my face with products from Ren. Ren is a luxe brand that uses plant-based, synthetic-free ingredients. Ren was completely new to me and I liked the facial products she used. From there she prepped my face with primer. Then applied foundation and translucent powder. All three products were from Tarte. I had heard of Tarte and seen them everywhere for years. I even had a few of their lip pencils. Yet I had no idea they fell into the natural beauty products category! My makeup artist completed my look with eye shadows, blush and lip colors from Hourglass. Hourglass is another luxe brand. One thing that I found appealing was the cool way of packaging their products. It looks so creamy and felt that way too! With my new look complete I wanted to buy everything she used on me! But it wasn’t in my budget. So how did I determine what products to buy? 1. While I loved Ren, I knew that there were more budget-friendly options for skin care so I passed on all Ren products. 2. Foundations and powders touch the most real estate on my face so I invested in Tarte products. I purchased the primer, amazonian clay mask foundation, the gel eyeliner and eyebrow pencil. And they were in the same price point as the old beauty products that I used to use. The eyeliner and brow pencil were add-ons. I needed refills on both so I went with both for convenience. Since I work from home I don’t wear makeup every day but these are my essential items for times that I do wear it. 3. I wasn’t going to buy any eye shadows or blush but gosh darn it, I loved the Hourglass palettes so much that I indulged. I used to hoard eye shadows but when I purged it all I realized that I didn't used most of them. I only used the same ones over and over again. So my new philosophy is to invest in the colors that I'll use and refrain from the the trendy ones. That’s how I justified my Hourglass purchases. I’ve been using these products for the about six weeks now and love them! As I mentioned in this post, my complexion has changed and my skin isn’t oily anymore! I’ve also noted that the Tarte gel eyeliner is a lot more gentle than the one I used to use. My eyes no longer get dried out. This was an unexpected surprise! Just a little of these products go a long way! 1. There are mainstream natural beauty products out there! 2. They are available in different price points from luxe to more affordable. 3. They’ve been a lot gentler on my skin. But yet, since this makeover, I’ve discovered a new retailer. 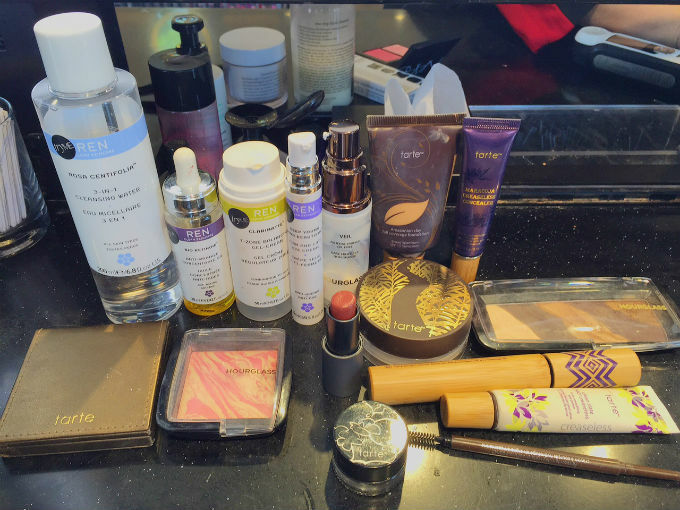 One that I call “the Sephora for natural beauty products.” I've come to love a bunch of their products that I've tried so far and will share those in the next few posts in this series!